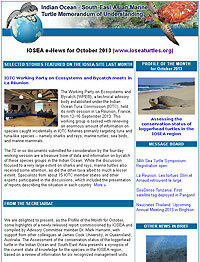 4 October - The IOSEA Secretariat has published, as the Profile of the Month for October, some highlights of a newly released report commissioned by IOSEA. The Assessment of the conservation status of the loggerhead turtle in the Indian Ocean and South-East Asia presents a synopsis of the current state of knowledge for the species in the IOSEA region, based on a review of information for six recognized management units. The IOSEA Secretariat also presents a detailed summary of the recent meeting of the Working Party on Ecosystems and Bycatch (WPEB), under the Indian Ocean Tuna Commission, which is arguably the most important partner for IOSEA from the standpoint of understanding and managing fisheries interactions with marine turtles. With the formal publication of the IOSEA Loggerhead Assessment, containing some useful guidance and recommendations for future conservation actions, the Secretariat will soon be encouraging the development of project concepts to move ahead with some of the suggested implementation priorities. The plan is to draw upon other IOSEA resources that have been earmarked for project activities. These might also be applied to some of the recommendations arising from the Leatherback Assessment, which was substantially revised in 2012.